Britain's Adam Yates said his first professional stage race victory at the Tour of Turkey was an unexpected bonus. Yates, 21, took the lead on stage six by winning an uphill finish and stayed out of trouble on the final two stages. "We weren't targeting the overall, we came here racing for stages," said the Orica GreenEdge rider. Yates moved closer to the first overall victory of his senior career with an impressive win on day six after a solo attack on the steep final section. He snatched the leader's jersey from Rein Taaramae, having finished a close second to the Estonian on stage three. "The key moment of our race was when I took the jersey off him," explained Yates, who turned professional this year. "The guys kept me out of the wind all day. I arrived at the bottom of the climb fresh, which was really important." Yates added four seconds to his overall advantage over Cofidis rider Taaramae on roads soaked by an early downpour. 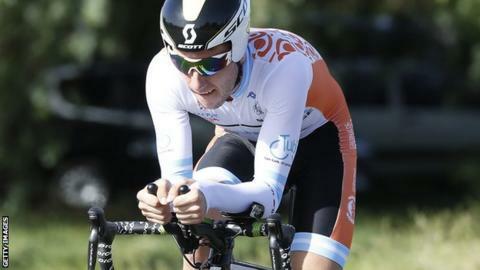 "We were never under any pressure, but it was stressful," admitted Yates, who knew race rules would protect his challenge for the overall victory if a crash in those conditions was inside the final three kilometres. "The rain at the start was quite dangerous. It's easy to slip or fall or get taken down by someone else. All the hard work during the week could be over just like that..
"I can't thank the team enough. Hopefully, there is more like this to come."